This one is a doozy. Basic D&D goes up to level 36. AD&D has no theoretical upper limit. D&D 3.X maxes out at 20 for normal play, then moves to Epic-level play at 21+. Pathfinder tops out at level 20. D&D 4E goes to level 30. I don’t recall playing any game of D&D past the low-teens. Ever. There also weren’t a lot of adventures written for those levels back in the day. The highest-level adventure I own is for characters of levels 16-20 written for Pathfinder. Fortunately, each successive edition of D&D featured a power jump, so what works for 14th-level in AD&D is a cake walk for 14th-level Pathfinder or D&D 4E characters. Conversion of these adventures will be more challenging, I think, so I’ll have to consider very carefully what to do to make it as close to the original as possible. As before, the adventures I’m favoring are highlighted in bold. I’ve probably read these adventures more than any of the others I own. I’ve played parts of most of them. One brilliant idea I had for running Steading of the Hill Giant Chief is to build the steading out of my old Lincoln Logs. Also, my copy of D3: Vault of the Drow is signed by both Gary Gygax and cover artist Erol Otus. Gary signed it in 2007, at the last Gen Con he attended. I’m not sure if I told Gary Gygax how influential his game has been in my life. I’m pretty sure I didn’t mention that every one of my friends I have because of D&D (my wife is my ONLY close friend I did not meet as a direct result of playing role-playing games). My life would have taken a very different path indeed were it not for D&D, and such a different path it would have been, I cannot even begin to imagine what it would be. I am very glad to have met him, though. That was one of the best Gen Cons ever. This was a harder category to define than “low-level.” Low-level was easy: they start at 1 (or in one case, 0). But where does mid-level begin? 4? 6? 11? In most versions of D&D, it feels to me like mid-level sort of kicks off at 4th level. Even squishy classes like magic-users or wizards can stand up to a house cat or goblin. Fights can still turn deadly, but usually you’re not in danger of dying to one hit. The characters are no longer wet-behind-the-ears neophytes. Of course, in modern editions of D&D, the power level has been upped to where even a first level character is arguably more powerful than a 2nd- or 3rd-level character from Basic D&D or AD&D. Of course, with an increase in character power level comes an increase in (most) monster power levels. So, for my purposes, I’m considering mid-level to start at level 4 for Basic D&D, AD&D, and D&D 3.X/Pathfinder. For D&D 4E, mid-level starts at the Paragon tier, i.e. level 11. Most of the adventures I own fall into this category, including many of the classic adventure series TSR published in the 80s. Choose from this list is really challenging as there are so many great adventures here. It’s tempting to choose not just one, but an entire series to run (like the Slavelords series or the Desert of Desolation). I may have to remain flexible and if we choose to go through the first in the series, and the players want to learn how the story ends, just play through the rest of the series before moving on to the next system or tier. As before, I highlighted in bold the adventures at the top of my list. Are there obvious adventures I’m missing on this list? Classics I don’t have or may not know about? I might be inclined to seek out a few of them, though some are rare enough and expensive enough on the secondary market that it would require donations of cash or the adventure itself to get me to consider purchasing it. * The title alone would normally make me include it in my Top Choices list, but Oriental Adventures has a different class list and feel than standard D&D. I’ll probably stick to more occidental-style adventures. I currently own twenty-four low-level adventure from which to choose. I define low-level here as being designed for characters of starting level between 1 and 3, except in the case of D&D 4E, where I’m just including Heroic Tier (level 1-10). I doubt I’ll choose any D&D 4E adventures, however, because they haven’t been out long enough to be considered “Classic” by most definitions of that word. One could make the argument that I should only consider modules from Basic D&D and AD&D since even D&D 3.X and Pathfinder could be considered too modern for any adventures achieve “Classic” status. I’ve also omitted Pathfinder Adventure path books from this list, though it might be interested to run an adventure path through the grinder of four different editions. Someday. That would be exhausting, I think. I’ve bolded the adventures I’m leaning to choosing for the Low-Level Adventure. I’m basing my choices on what I think people have at least heard of, even if they don’t have first-hand experience with them, but not so common that most players could know all the important details (like The Village of Hommlet or Keep on the Borderlands). Ultimately, I’ll probably lay out half-a-dozen adventures, and let the group have a vote. Keep Away from the Borderlands! You’d think living in Indianapolis, it would be easy to find other gamers. This is the home of Gen Con, after all. It’s true that there are a lot of gamers here in Indianapolis, and when I was living on my own, it was easy to find people. But when you have a wife and step-daughter living with you, there are other factors to take into account. The gamers I invite to join me I will be inviting into my home, sharing my personal space (to some extent) with, and giving them food and drinks. I don’t do that (especially the home invitation part) for just anyone. Since I’ll be inviting my wife to join me as a player, her opinion will count when it comes to adding someone to the group. It would count anyway since it’s her house too (technically, it was her house before it was mine), but her opinion weighs double now. So, I’m starting with people we both know. Not everyone will be interested in this, though. I may have to recruit from outside my regular circle of friends and acquaintances, and that process is always challenging. Every time I’ve advertised for gamers at a gaming store, the respondents I get are the type of gamers you generally don’t want to invite into your home. We’ll see how it goes. Basic D&D – I’m referring to the Basic, Expert, Companion, Master, & Immortals Boxed sets by Frank Mentzer, the ones compiled into the Rules Cyclopedia. There’s little enough difference between the boxed sets and the Rules Cyclopedia that I’ll probably run the game from the hardcover and leave the Player’s Handbooks from the sets available to my players. I’m not going to run Immortals anyway. If a player has the Moldvay books and wants to use those through level 14, I’ll allow it. Hell, back in the day, we freely mixed material from D&D and AD&D 1st edition with no conversion and didn’t encounter anything game-breaking; it’s just not that rules-heavy. AD&D – Advanced Dungeons & Dragons. 1st edition. This edition was still coming out when I started gaming. I think the Monster Manual II was the newest book available; certainly it was one of the first books I bought with my meager allowance. AD&D 2E – Advanced Dungeons & Dragons 2nd edition. I’m debating whether or not it is sufficiently different, mechanically, from AD&D 1E to make it worthwhile running the same adventure under both system. The materials were pretty much interchangeable, and in fact, that is exactly what we did. I don’t recall anyone I ever gamed with taking the effort to update 1st edition adventures to run them under 2nd edition, except to beef up the monster stats. D&D 3.X – Third edition Dungeons & Dragons produced by Wizards of the Coast. Running the same thing for 3rd edition and 3.5 would be silly since, while there are differences, they aren’t that significant. Besides, I ditched most of my 3rd edition books about a year after 3.5 came out. Pathfinder – Paizo Publishing’s update of the D&D 3.5 rules. Around the circles I hang out in, this is sometimes referred to as 3.75. In fact, I’m going to go out on a limb and annoy some people: I’m using Pathfinder instead of D&D 3.X for this blog. Running the same adventure under each of those rules sets would get monumentally boring and probably incite me to hang up the DM Screen for good. Besides, I ditched most of my 3.5 books once I had the three main Pathfinder Core Books. D&D 4E – The current version of Dungeons & Dragons produced by Wizards of the Coast. I appreciate the ease of prepping games under this system, but it is my least favorite. I don’t hate the game, I just prefer something else. If you like it, that’s fantastic. Once I’ve run through all these editions, I might run some bonus games with the same adventures using alternate fantasy RPG systems, like HackMaster Basic, AGE (DragonAge), Arcana Evolved, etc. But that’s far off in the future. I was chatting on Twitter one day with my friend Enrique from over at NewbieDM, and he said someone should do a blog where they play a classic D&D adventure, then re-run it with the same group, using a different edition and keep doing so, until you’ve gone through all the editions. During this time, they would blog about their experiences and compare the editions and the adventure (how it ran under it’s native system vs. how it runs with updated mechanics, etc.). Since the death of my first wife in November 2008, I’ve sort of been on a gaming hiatus. I still play once in a while, and I GM at conventions, but I haven’t had a regular home-based group since early 2009. During Gen Con 2011, my wife and I (if you’re having trouble following that: I remarried) purchased a table from Geek Chic. 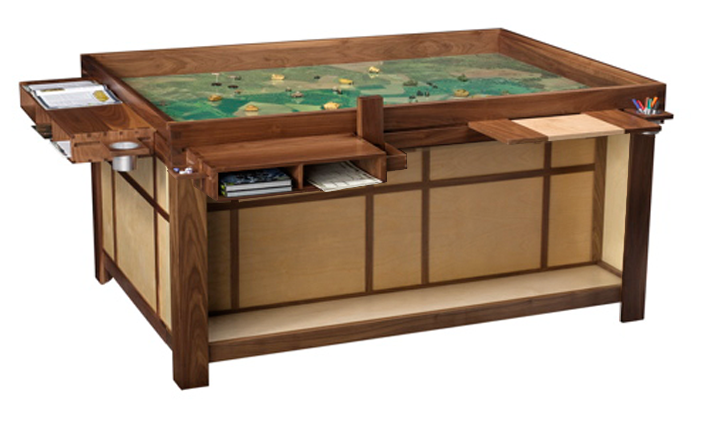 I figured, if I’m going to have an heirloom quality gaming table, why not christen it with a project like this? In case you’re wondering, my table will look something like this. My Spartan is a Fellowship-style and is on schedule for a late-February/early-March delivery, giving me plenty of time to clear out all the other furniture in that room that has no place in my happy little gaming haven. I haven’t decided if I’m going to name my table or not. It seems silly, yet awesome to do so. Hopefully, I can get the furniture moved out before the weather turns really bad. If I do, I have some folding tables I can game on and get this thing rolling in January! Of course, this will require me to put together a group of exceptional gamers. Gamers that are dedicated enough to be able to play the same 3 (or so) adventures at least 4 times in a row using basically the same characters.